The fight has ended. 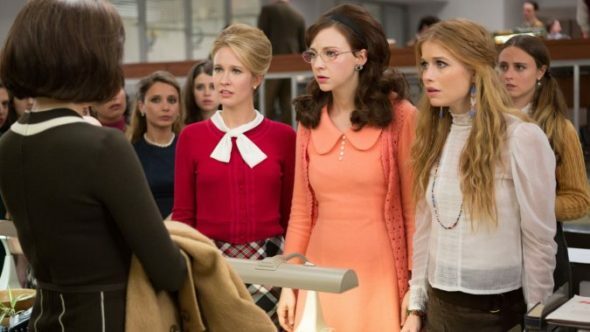 Deadline reports Good Girls Revolt is officially over after Amazon cancelled the series last month. What do you think? Have you seen Good Girls Revolt? Do you think it should’ve been renewed? Just finished watching Amazon ‘Good Girls Revolt ” again!! !..such style, superb acting and excellent story line!! Still feeling this “the one that got away”.!!! Loved it sincerely ..loved the actors, screen plot, set and costume design. Wish that it could have been picked up elsewhere. Sad it wasn’t..Dana Scalvo-Thank you for the 10 Ep that we were delighted to see, as well as, the fight to see it live on. All of you involved …You rocked! Great show, perfect for another season. What happens to the girls after the lawsuit? How do the men react? So much more of a story to be told! I enjoyed Good Girls Revolt VERY much. My husband and I loved this show. The actors, all of them, were excellent. We were very disappointed to see the show cancelled. Very unfortunate. I really do not understand the reason. Could it possibly be the subject matter? Surely not, this is 2017. We were so in hopes another network would pick it up.